The weather is getting warmer and we're heading into summer...and that means STATE FAIRS!! My first experience of this event was the Iowa State Fair. My spiritual mom, Sherrie, who was born and raised in Des Moines Iowa would make every effort to take a group of us there every late summer. We would book a hotel and spend a day or two just enjoying and taking in the sites and sometimes not-so-great smells of what a great state fair has to offer. Yes, deep fried everything is what you can find at a state fair. If I can recall, they offered deep fried twinkies, snickers and something else other than oreos but man oh man, it's definitely worth an intense workout or two. But seriously, it's only once a year and it doesn't hurt to indulge in just one cute little deep fried cardiac arrest, is it? Not real sure if the Iowa State Fair has deep fried bacon but they should. Out of all the videos, I prefer her accent and presentation! :) Thanks Liz, I'll definitely try this recipe after my husband is off of Lent (he gave up sweets and junk food...hehe). Link to the Iowa State Fair. Links to the creator of the Butter Cow, Norma "Duffy" Lyon. A video on Iowa Public Television site of Duffy Lyon creating her famous sculpture in 1974. The salad recipe I'm sharing with you was inspired and created for my family during our body cleanse diet. I know that doesn't sound quite appetizing but don't let it deter you from trying this meal. It's quick and easy to make and also very healthy for you if you eat less pasta than I did. My husband came up with the name and to be honest I really like it and find it appropriate. I mean we're talking healthy greens, whole wheat pasta and a salad dressing that involves organic Apple cider vinegar. Overkill on my part? Maybe. But I love this and I'm going to share it with you. Cook pasta according to instructions on box or do what I do, bring about 8 cups of water to boil, add some salt and olive oil. Once the water is boiled add pasta and cook for about 8-9 minutes until it's "al dente." The texture is soft yet a little chewy at the center. 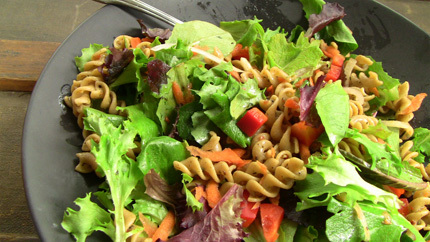 Drain pasta and coat cooked pasta with some Eden Salad Dressing in a bowl. Arrange spring salad mix into two plates or more. Sprinkle diced red bell peppers and onion slices. Add cooked and coated pasta on top of salad bed. Add raw seeds or nuts for an extra crunch. Drizzle extra Eden Salad Dressing and enjoy! 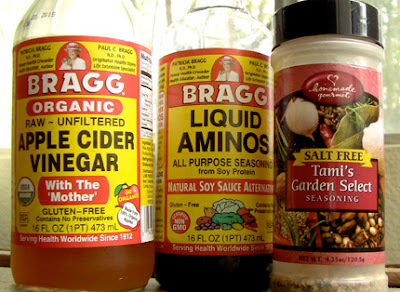 The dressing is what would take a little more prep time when it comes to finding where to buy the ingredients and if you have a friend like I do like my girl Kinisha, who kindly gave me some great seasonings and salt free alternatives from Homemade Gourmet. I eyeballed the following amounts but you can mix according to what you like more or less of. You can add all the ingredients into a salad shaker or a small food processor but either way you want to give it a good shake or mix before you serve it. Over the last year, my husband and I have come to enjoy and crave the taste of some really good kale. I've sauteed kale and used it in soups, each time realizing more and more how wonderfully taste-absorbing this leafy green can be. So last week, on a cloudy cold day, I decided to make Smoky Potato Kale soup. The "smoky" flavor comes from three small smoked ham hocks. You can find this at your local grocery store in the meat department by the pork or beef section or better yet your local butcher shop. In addition to the hocks I also used some bacon ends to add that distinct buttery fat flavor to the soup. Bacon is an aphrodisiac in this household, it's what enhances our love for each other on chilly days. Bring 8 cups of water to boil. Add ham hocks and let boil on medium heat for about 45 minutes or until ham hocks are tender. While the ham hocks are boiling, fry bacon over medium heat until bacon is crispy. Add all contents of bacon fry pan into the pot of ham hocks immediately. Add potatoes, onions, garlic powder, bouillon, parsley flakes, salt and pepper. At this time you can also cut up the soft ham hocks into bite sized pieces and put back into the pot. 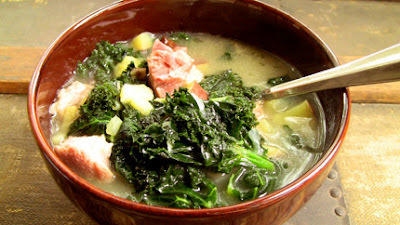 Once potatoes are tender, add kale and serve soup once kale is tenderized. A deep dark green is a great time to serve it, unless you like your kale super soft. Serve with warm wheat, rye or pumpernickel bread. Some smoothie recipes include Strawberry Shortcake, Peach-Ginger, Cucumber-Kale (interesting), Mint-Jalapeno and so much more. For today, I have my eyes set on No. 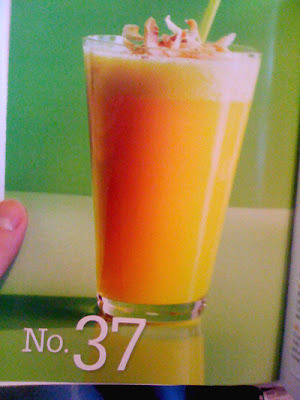 37 Pineapple-Mango. "Blend 1 cup each chopped pineapple and mango, 1 cup coconut water, a dash of ground allspice and 1 cup ice. 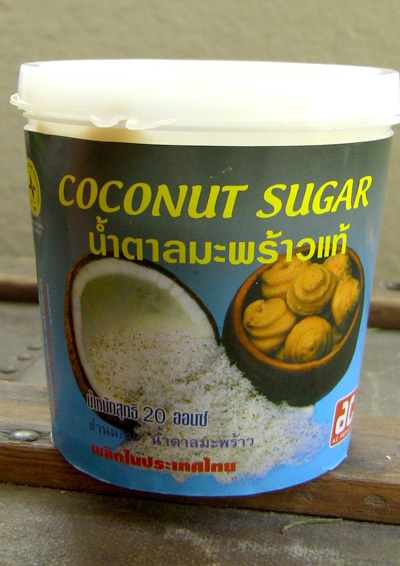 Sprinkle with toasted coconut." If it was a weekend smoothie, I'd add 2 oz of coconut Malibu Rum! 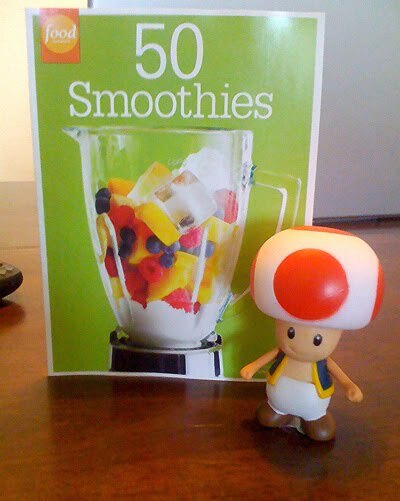 Thank you Food Network for great smoothie ideas. 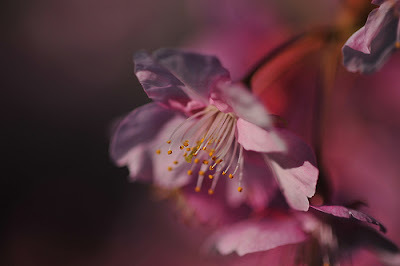 My heart goes out to the people of Japan. We are continually praying for the families and victims of this powerful earthquake and tsunami. The least we can do is to support our rescue workers traveling to Japan to offer relief. I don't know too many places to donate to but my husband and I just donated some money to the American Red Cross via our phones. All you have to do in order to donate $10 is to text REDCROSS to 90999. Follow the prompts and your donations will be made. For more information on donating to this foundation visit this link. To my fellow gamers of Farmville, Cityville or Mafia Wars, check out this link from TechCrunch to see how you can make a difference through in-game purchases. From the moment you take a bite of this dish you realize that you have tasted something totally different and out of this world. There has never been a taste so distinct from my childhood memories as with the flavor of Prik King. I'm so thrilled that I can share one of my favorite Thai flavors with you in this post today. 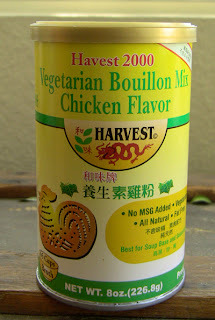 I hope you can find the ingredients you will need (I completely feel for those who have a hard time finding authentic asian groceries) because it's worth it. I'm listing the ingredients first but I have reference pictures posted so you know what you can look out for at the grocery store. 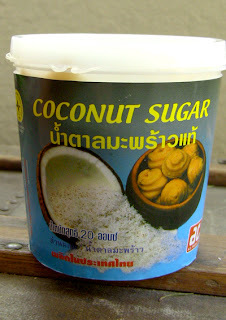 Adapted recipe from Thai Eyes. Heat pot with boiling water. Add yard long beans and blanche for about 1 minute. Drain and set aside to cool. Heat 2 tablespoons of oil in wok/pan. 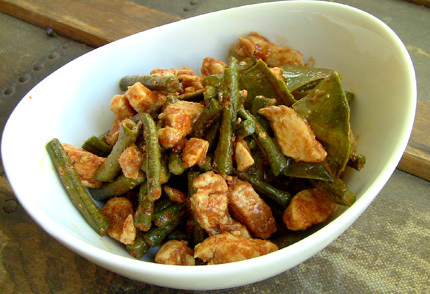 Stir fry chicken and lime leaves. Cook chicken until done. Gather chicken and lime leaves to side of wok. Add 1 tablespoon of oil on empty side of wok. 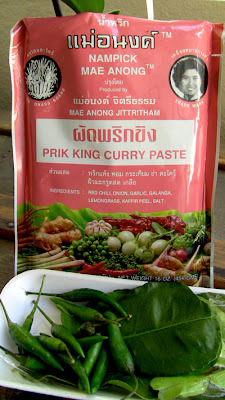 Add Prik King paste, coconut sugar, bouillon mix and fish sauce. Mix pastes and sauces until well blended. Add cooled yard long beans to wok and stir all ingredients until well coated. Add a couple tablespoons of water if it's looking dry. Salt & Pepper to taste. Don't overcook your beans, keep an eye on them. And remember, flavor your food the way you like it best! No rules, only enjoyment. Serve with Jasmine rice or long grain brown rice. Our favorite condiment to go with most of our Thai food is a side of minced Thai green chilies drowning a small serving container filled with Fish Sauce and squeeze of lime. Hmmm Hmmm Hmmm. 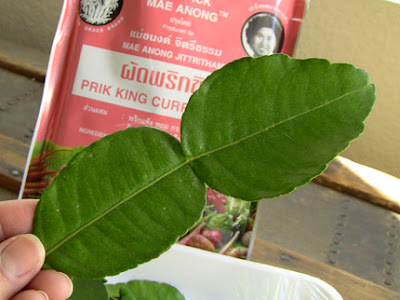 Can be called Kaffir or Lime Leaves. Very distinct flavor. The brands can be different but works just the same. 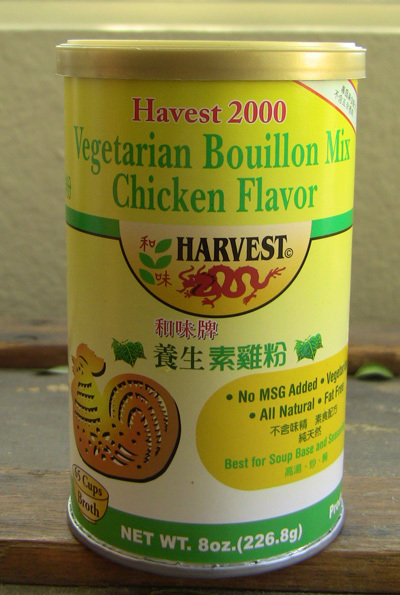 Great for flavoring foods and with no MSG. Just look at this beautiful sight! I promise you that it's better when you make this from scratch than if you buy it pre-made and ready to bake. 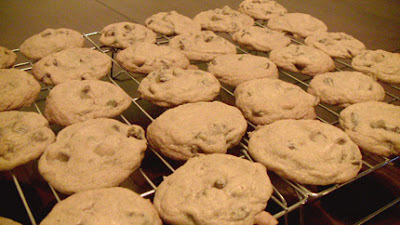 Nestle Toll House Chocolate Chip Cookies are definitely at the top of my family favorites. It's super easy to make and the freshness lasts longer. A little tip: Bake the cookies a minute or two shorter than what the recipe provides. If you have a cookie jar...all the more freshness you can enjoy for a longer period of time. Happy Baking! Jamie Cullum, what can I say about him? Well he's incredibly talented and I've enjoyed his music and talent ever since his album Twentysomething in 2003. Believe me, if you like cool, new, young jazz combined you'll enjoy Twentysomething. Today I decided to delve into some music videos and found this one, a cover of Rihanna's "Please Don't Stop the Music." I was never fond of the dance version but with Jamie's touch I think I can actually enjoy it by adding this song to my Pandora list before I cook. For more on Jamie Cullum visit his official site. In highschool I always enjoyed my science classes and in fact, won best science shows a handful of times. One was about smoking and health awareness and another for creating fake gold on copper coins. Fun times in the lab. Well now that I'm older and enjoy creating in the kitchen, it's about to get more interesting with the availability of molecular gastronomy kits via Molecule-R or ThinkGeek. But here is a trailer from Saveurs MOLECULE-R's YouTube channel. If you like to embark on this tasty experiment visit their website to purchase the kit. Have a blast!